I don't know what's kept me so occupied, honestly. It just seems like I am back and forth to work, back and forth to home, punctuated by forehead-slapping moments or amazing foods or interesting conversations. 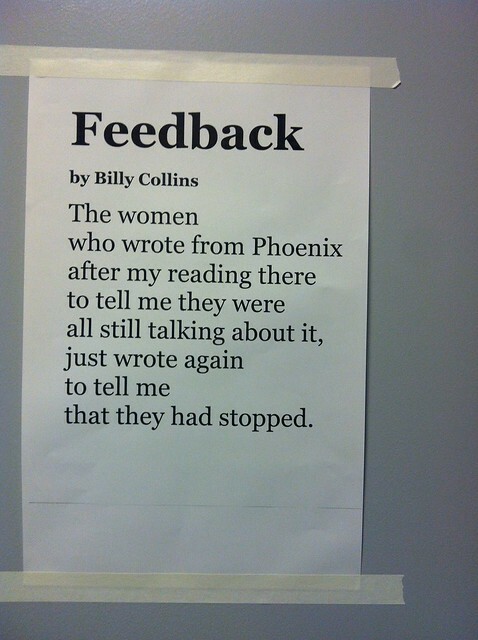 It is poetry month, which is a big deal at my office as my boss is a patron of poetry - if that is possible. A couple of years ago, in a completely spontaneous and organic way, the office was "Poetry Bombed" when someone left this poem on the refrigerator in the company kitchen. Poems popped up in other unexpected places too, much to the delight/consternation (we don't publish poetry!) of the entire staff. We had a poetry lunch, with a poetry organization, we outed the Poetry Bomber and celebrated. In the two years following we have continued the tradition. This year I am one of the weekly poetry bombers and, so, K and I will go into town today and place my poems around the office. I worked for a few hours on them yesterday and will post photos of them in situ. One of the "bombers" left this one last week. I'm a fan, but I find myself wanting to push creativity more. Hence the Robert Burns inside the empty scotch bottle I plan on leaving today (which, now, seems so obvious - perhaps it should be just ANY Burns poem and not just one about scotch...ah, well, it was tough enough getting it in there). Spring has come. I don't have an issue with Spring, it's Summer I don't care for. People are walking around with bare ankles and arms. it was 57 that day, not 87.
as the one in our bedroom merely breathes tepid air on us and that won't do this year, for me. We've done the pear/Gorgonzola/honey/bread thing twice now. It's a perfect spring meal. Just because the dumb girl is wearing white before Labor day (or whatever the rule is!) I'm sending you the blizzard we had on tuesday! Hey, I got the day off, couldn't see across the street but at least I got to stay home. Your work life sounds delightful. Really. Perhaps she was on her way to her First Holy Communion service? I don't think you should exclude this possibility.